In our session we talked about the fact that Jesus asked his disciples who they thought he was.Peter of course came up with the right answer: ‘You are the Christ’. We too know that Jesus is our Lord and our friend. Jesus also explained that his followers would often have difficult times (‘they must take up their cross and follow him’). We know that sometimes things can be difficult but with Jesus’ help we can always manage to overcome them. 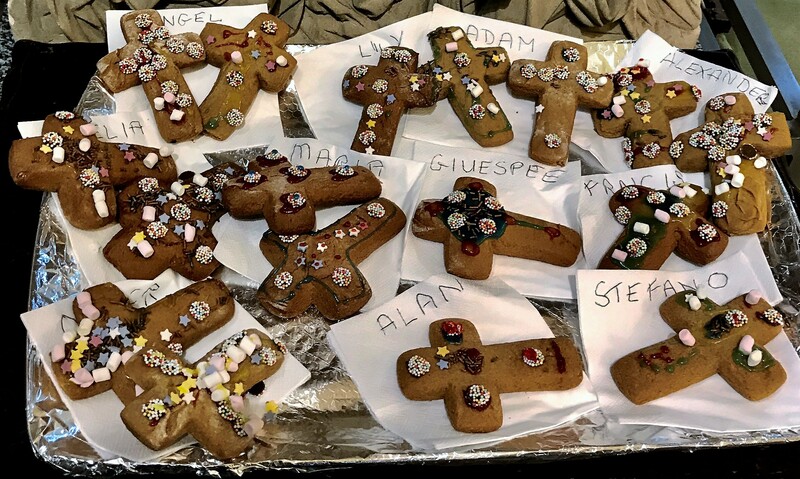 The children decorated gingerbread crosses for their activity. They will ‘carry their cross’ home. When we discussed the Gospel reading today we looked at an empty suitcase! This was to remind us that when Jesus sent out the disciples in two’s, he told them to ‘take nothing’ with them. We talked about the fact that Jesus says the same thing to us today – that we don’t need to worry about gaining things, because Jesus will provide everything we ever need. 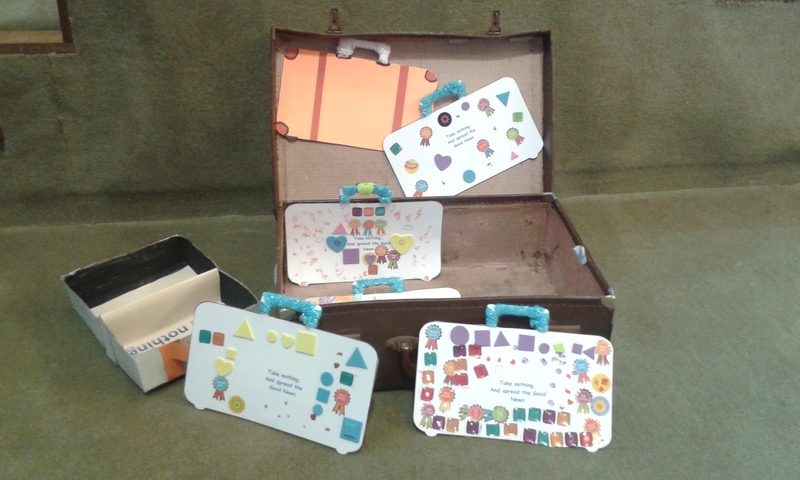 To remind us of this, the children decorated cardboard suitcases, which we displayed in and around our large case in front of lectern. 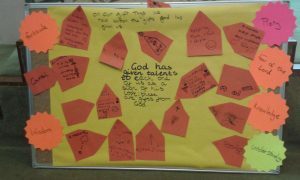 This was to show the congregation that when we spread the Good News of Jesus Christ we need nothing but our faith in the Lord. 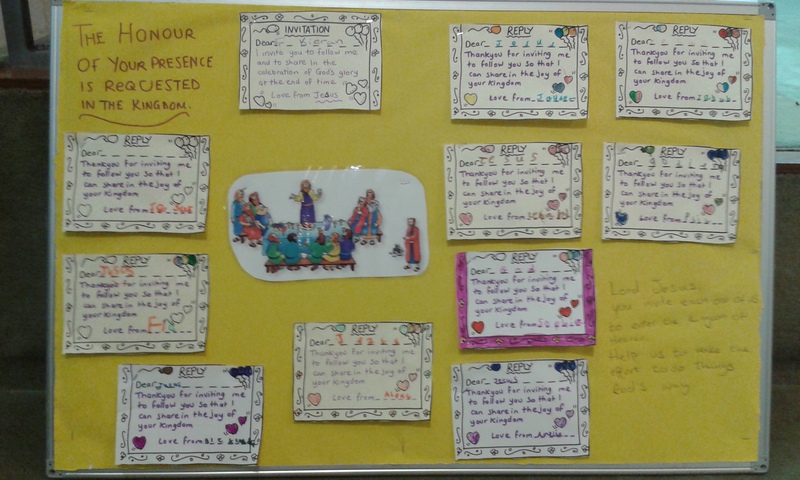 In today’s Gospel reading the children heard about Jesus calling his disciples. They understand that each and every one of us is also called to follow Him in their lives. 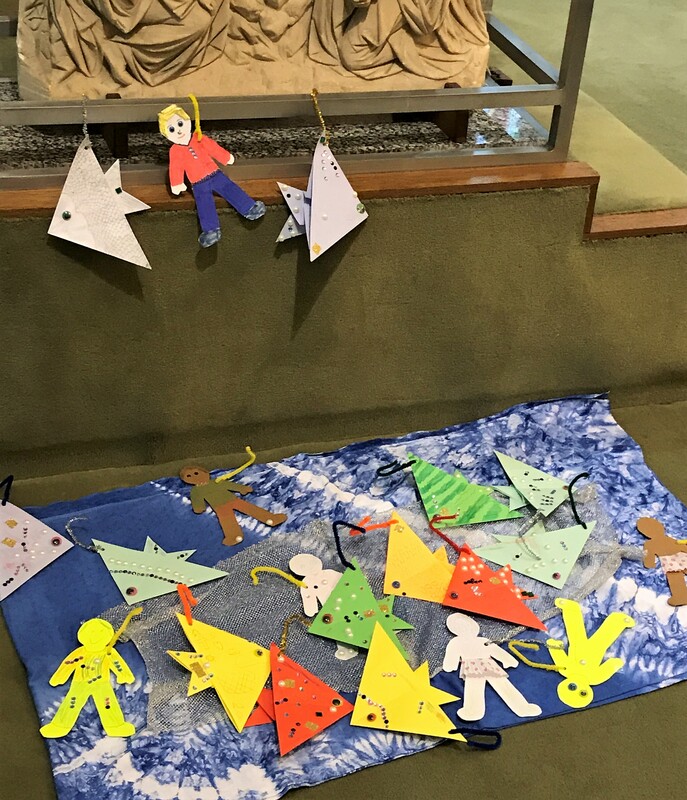 The children heard that we should also try to encourage others to get to know the Lord and follow him – so becoming ‘fishers of men’. To celebrate this they decorated fishes – and people! 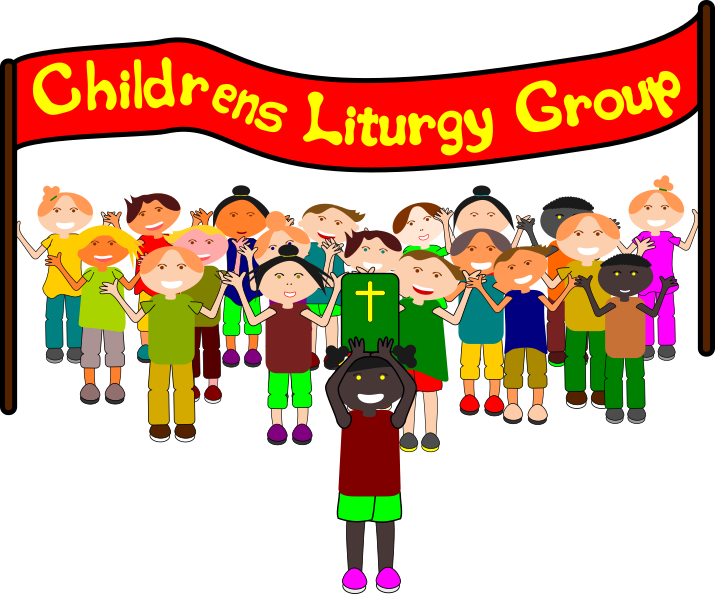 In Children’s Liturgy of the Word, the children decorated candles. 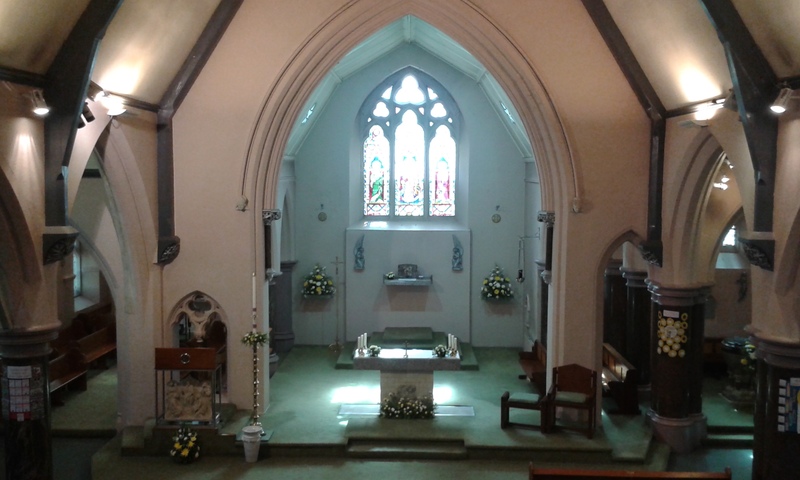 The ‘electric’ candles were switched on and placed in front of the lectern during Mass. 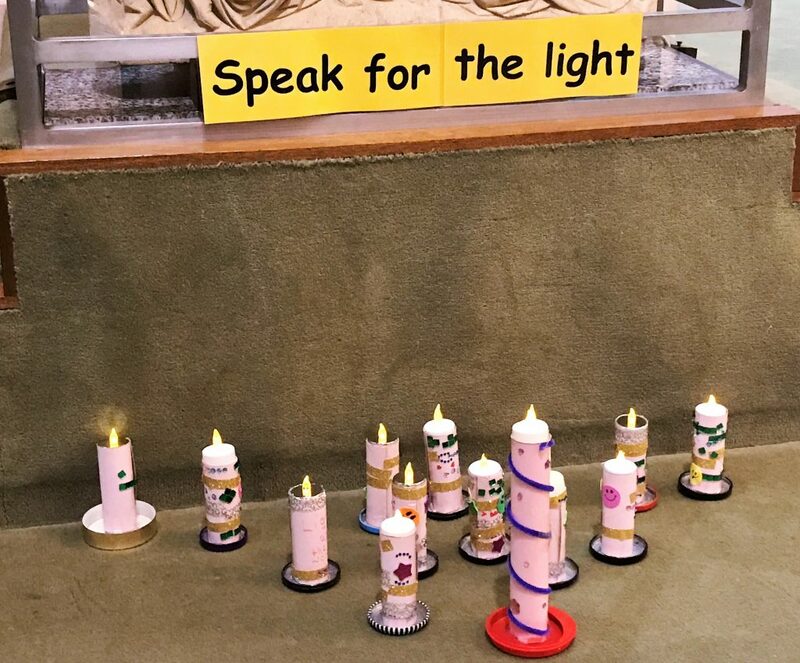 Following the reading from this Sundays Gospel, the candles represent the light of Christ and our aim to ‘speak for the Light’ – just as John the Baptist did. 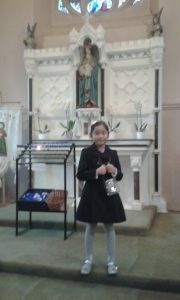 The children took their candle home after Mass. In so doing, they spread the Word ever further! This Sunday is the feast of Christ the King. It marks the end of the Catholic Church’s year. 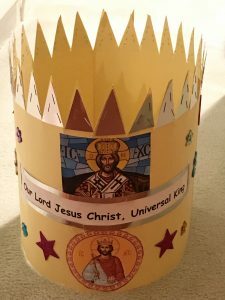 Today our children made paper crowns in honour of Christ the King. 1 ‘Then the kingdom of Heaven will be like this: Ten wedding attendants took their lamps and went to meet the bridegroom.2 Five of them were foolish and five were sensible:3 the foolish ones, though they took their lamps, took no oil with them,4 whereas the sensible ones took flasks of oil as well as their lamps.5 The bridegroom was late, and they all grew drowsy and fell asleep.6 But at midnight there was a cry, “Look! The bridegroom! Go out and meet him.” 7 Then all those wedding attendants woke up and trimmed their lamps,8 and the foolish ones said to the sensible ones, “Give us some of your oil: our lamps are going out.” 9 But they replied, “There may not be enough for us and for you; you had better go to those who sell it and buy some for yourselves.” 10 They had gone off to buy it when the bridegroom arrived. Those who were ready went in with him to the wedding hall and the door was closed.11 The other attendants arrived later. “Lord, Lord,” they said, “open the door for us.”12 But he replied, “In truth I tell you, I do not know you.” 13 So stay awake, because you do not know either the day or the hour. 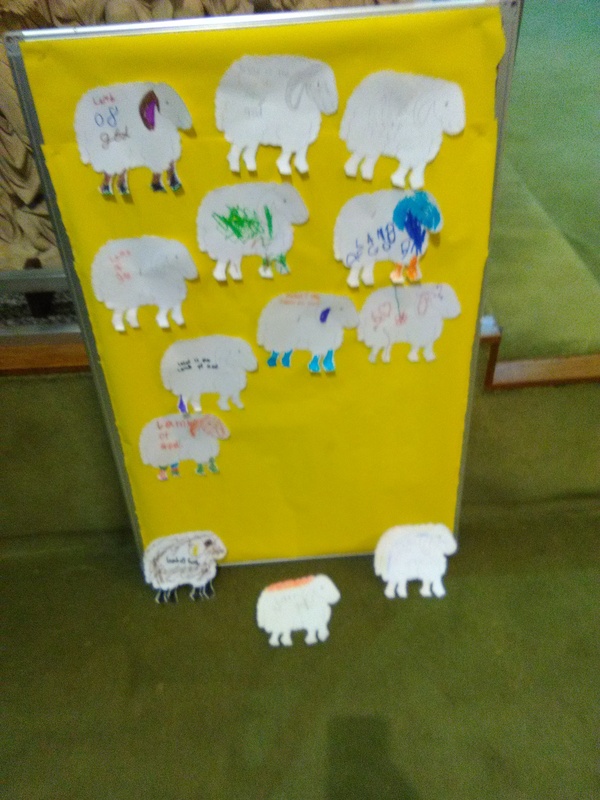 Today the children made their own lamps representing their faith in God. 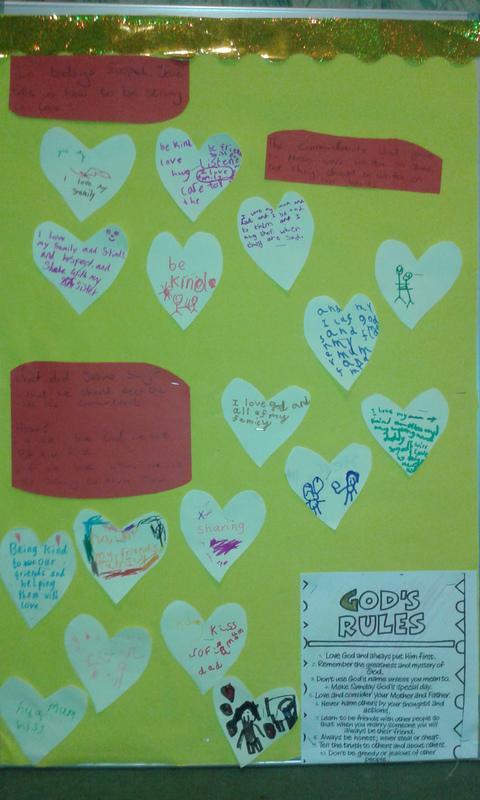 Today the Children’s Liturgy group considered ways of Loving the Lord our God with all their heart, soul and mind. 1 And Jesus answering, spoke again in parables to them, saying: 2 The kingdom of heaven is likened to a king, who made a marriage for his son.3 And he sent his servants, to call them that were invited to the marriage; and they would not come.4 Again he sent other servants, saying: Tell them that were invited, Behold, I have prepared my dinner; my calves and fatlings are killed, and all things are ready: come ye to the marriage.5 But they neglected, and went their own ways, one to his farm, and another to his merchandise.6 And the rest laid hands on his servants, and having treated them contumeliously, put them to death.7 But when the king had heard of it, he was angry, and sending his armies, he destroyed those murderers, and burnt their city.8 Then he saith to his servants: The marriage indeed is ready; but they that were invited were not worthy.9 Go ye therefore into the highways; and as many as you shall find, call to the marriage. 10 And his servants going forth into the ways, gathered together all that they found, both bad and good: and the marriage was filled with guests.11 And the king went in to see the guests: and he saw there a man who had not on a wedding garment.12 And he saith to him: Friend, how camest thou in hither not having a wedding garment? But he was silent.13 Then the king said to the waiters: Bind his hands and feet, and cast him into the exterior darkness: there shall be weeping and gnashing of teeth.14 For many are called, but few are chosen.